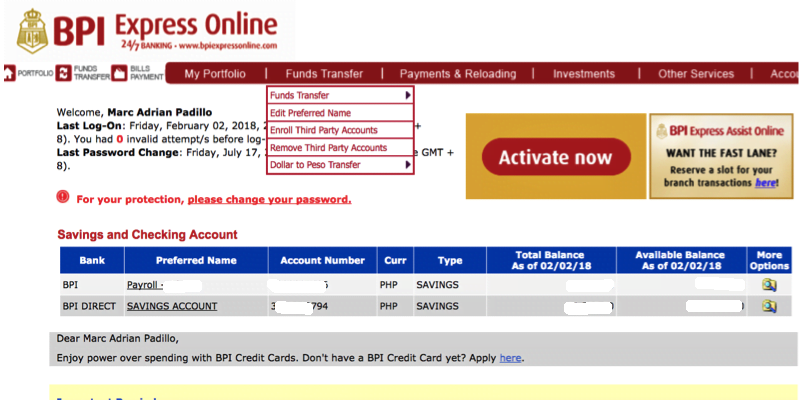 BPI Express Online is an internet-based cash management system of Bank of the Philippine Islands for their individual customers, while the BPI Express Link is designed for their corporate clients. The Express Link have most of the features of the Express Online, from online inquiry of deposit accounts' balances, data file transfers, to fund transfers. However, since the Express Link is tailored for their corporate clients, this system also have additional features designed to cater to the needs of corporate cash management such as payroll uploading, BIR tax payment, collection and payment transaction, etc. Basically, the Express Link is designed to achieve the benefits of work simplification via automated and straight-through processes, meanwhile the BPI Express Online is designed to achieve individual banking needs. 4. 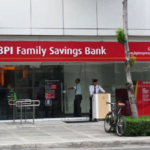 Go to a BPI ATM to complete the activation of your online banking account. 5. Insert your card and key in your pin 6. Go to Special Services > Activate >Enrollments Express Online 7. Wait for 5 minutes before accessing your online account. 4. A confirmation email together with a form will be sent to your registered email. 5. Print the form 6. Fill up form and sign. 7. Mail the completed form to: BPI Fulfillment Banking Department 9th Floor BPI Card Center 8753 Paseo de Roxas Makati City 1200, Philippines 8. An email advice will be sent to you once the processing of your request has been completed. 4. A confirmation email together with a form will be sent to your registered email. 5. Print the form. 6. Fill up form and sign. 7. Mail the completed form to: BPI Fulfillment Banking Department 9th Floor BPI Card Center 8753 Paseo de Roxas Makati City 1200, Philippines 8. An email advice will be sent to you once the processing of your request has been completed. Choose "Enroll Now" under Online Banking log in. 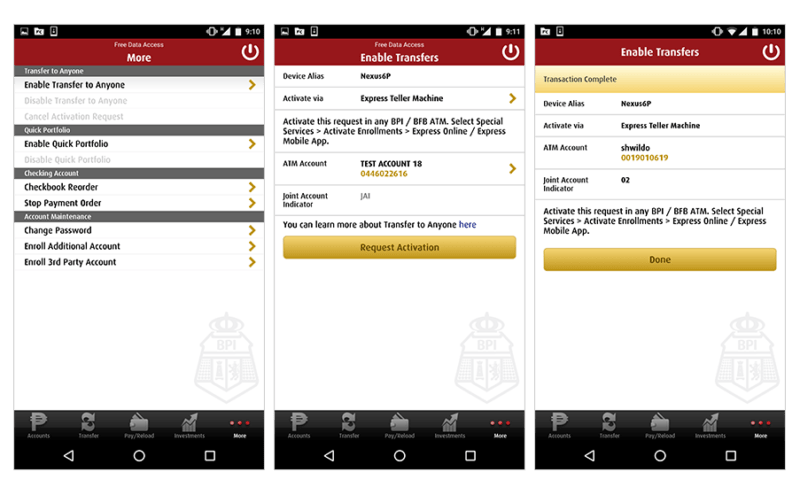 There are two ways to access BPI express online - browser and app. 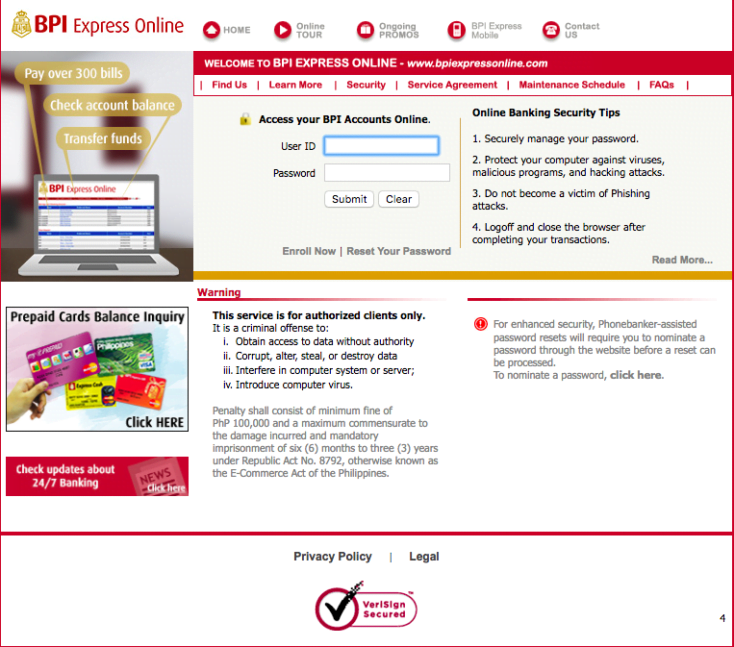 Go to the website www.bpiexpressonline.com and then click "Online Banking Login." Once downloaded click on the app and it will take you to page with various menu/option. Click "Accounts." Enter your login credentials and tap the "login" button. If you choose Via Express Teller Machine, you will be asked to activate your request via any BPI ATM using the ATM card of the account you specified. 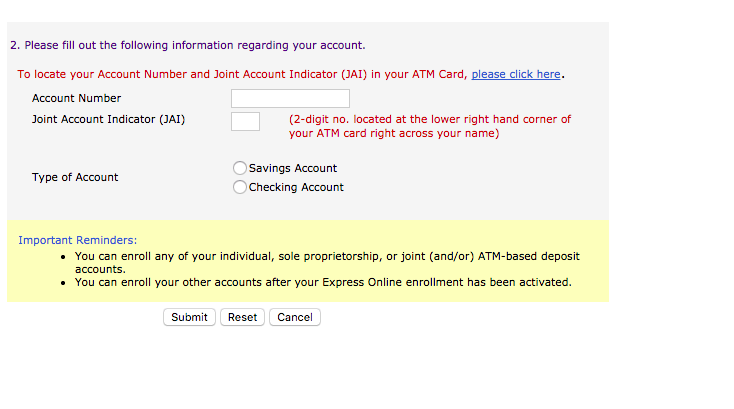 Please do so within 5 days after filing the request.Select Special Services > Activate Enrollments > Online Banking. You will receive the activation code via email after 5 minutes. In case you get an error advising you of a pending request: Log in to Online Banking and select Account Maintenance > Cancel Pending Enrollment > Cancel the Pending Request. If you're unable to file the request, or have NOT yet received the activation code within the set amount of time, call 89-100. 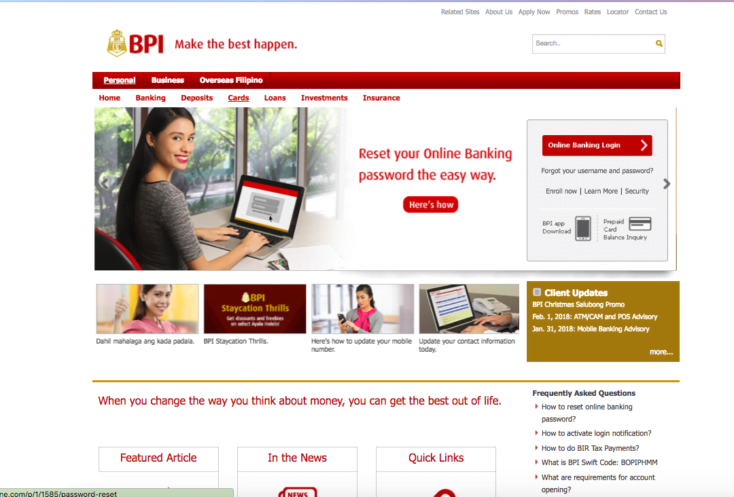 Access to all of BPI's websites (BPI Express Online, BPI ExpressLink, and BPI Trade) is secured using Verisign's Security Certificate which enables SSL for end-to-end encryption and for clients to verify the authenticity of their sites. Pre-enrollment procedures for critical financial transactions - This is a pre-requisite procedure for critical transactions where clients nominate third party accounts through a signed application form and these are stored in BPI's enrollment database. 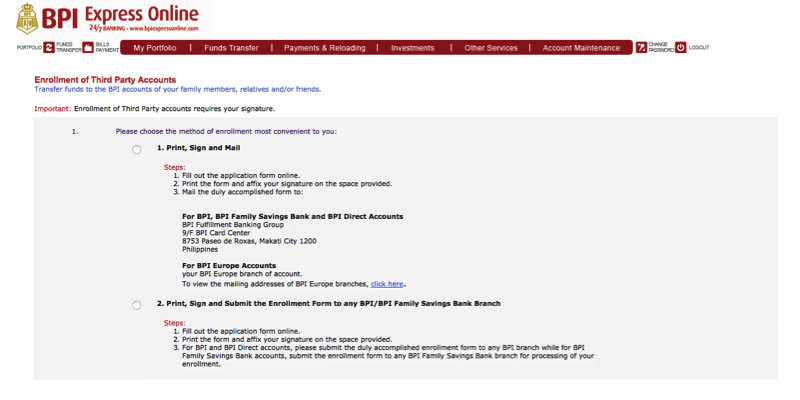 Thus, during a funds transfer transaction, if the recipient/third party account is not found in BPI's enrollment database, Express Online will not complete the transaction. 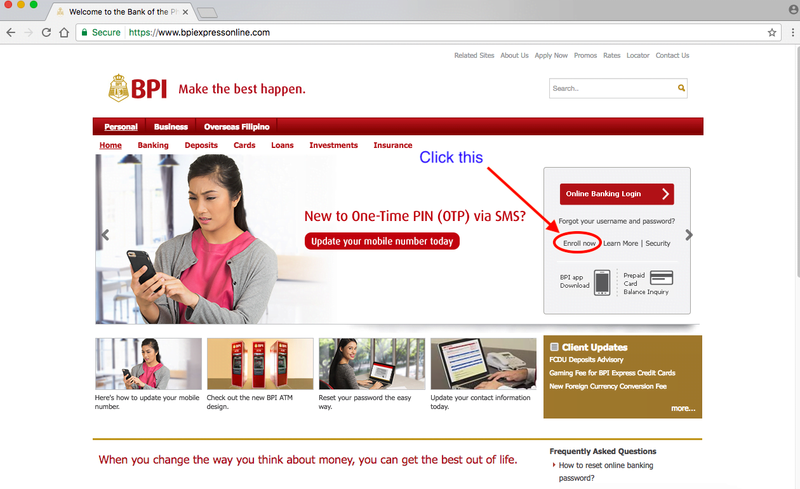 E-mail Confirmation/Alert - They also send clients a confirmation advice in their registered email address for every financial transaction done with BPI Express Online. Whether you fancy automating your finances or you prefer doing it the traditional way, signing up for a BPI Express Online account will surely save you time and effort. It’s a win-win for both users and the BPI. Don't have a BPI account yet? 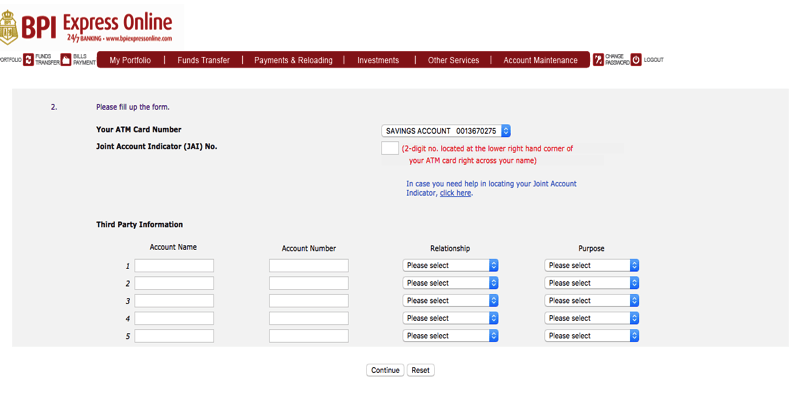 Find one that will suit your financial goals in our savings account listing page. 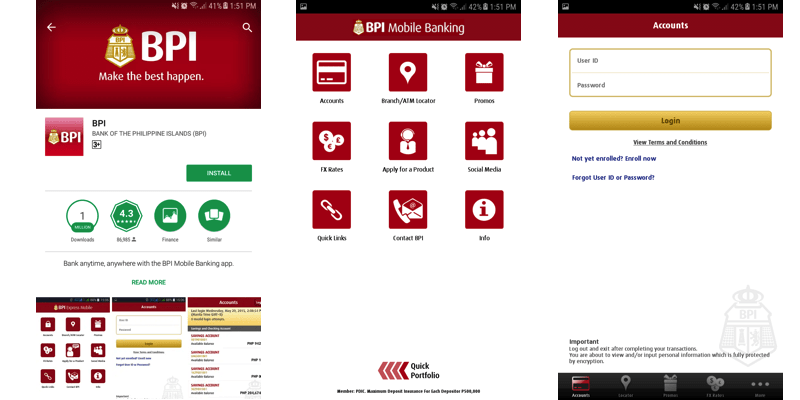 The post Your Guide To Using The Bpi Express Online Banking Service appeared first on iMoney.ph.